I offered to make my cousin a birthday cake the other day, and she mentioned that she liked both lemon and "raspberry accents." I was immediately reminded of a delicious wedding cake I had at some point in my past. Unsurprisingly for me, I can't remember who it was getting married, or anything about the ceremony, but I distinctly recall delicious white cake sandwiched with tart but smooth lemon buttercream and some sort of raspberry jam or sauce. I am usually a reliable chocolate fan, and I am not really into buttercream (sacrilege I know), but this cake somehow got everything right. And it looked beautiful too: the very white color of the cake and the buttercream contrasted dramatically wtih the deep pink of the raspberry. I decided I needed to recreate the dessert, but in a birthday cake size. I scoured the internet for recipes, and found quite a lot out there. Again and again, though, I found recommendations to make Dorrie Greenspan's perfect party cake. Like the wedding cake of my memories and dreams, it features raspberry jam and lemon buttercream. Unlike the dessert as I remember it, the cake itself is also lemon scented (rather than vanilla). 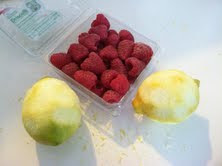 I decided more lemon could only be an improvement, and set out to make it. All in all, I was very happy with the result. When I first tasted the buttercream, I was not happy. I really don't like the texture of most buttercreams: it just reminds me too much of eating a stick of butter plain. I thought the lemon would help, but on its own I just thought it tasted like acidic, sweet butter. I was, however, pretty much won over once I had it as part of the cake. It worked really well with the other components, and the texture even reminded me of the wedding cake that had inspired me. (Franklin, who had some of the cake, wasn't quite as convinced, so it may not be for everyone.) I didn't get my layers to look quite as perfect as those wedding cake bakers had, but the pinks and whites still made a pretty contrast. Time: About 3 hours, start to finish. Sweetness Factor: 7; Indulgence Factor: 6; Difficulty Factor: 6 Chance We'd Make It Again: 6. Set the oven to 325. Butter two 9 inch pans; line the bottom with parchment paper; butter and flour the lined pans. Mix the dry ingredients in one medium bowl; mix the milk and egg whites in a separate bowl or cup. In the bowl of your mixer, blend the lemon zest and sugar on low for 15-30 seconds (just long enough so your kitchen smells like lemon perfume, and the sugar and lemon look combined). Add the butter, and beat at medium for about three minutes. Then alternate adding the dry and wet ingredients, 1/3 of each at a time. After each addition, beat on low/medium until combined. After the last addition (the final 1/3 of the wet ingredients), beat at medium for another 2 minutes. Pour the batter into the prepared pans. 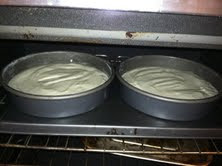 Bake for about 30-35 mins: the cake will spring back when touched, and a tester will come out clean when it is done. Cool for five minutes in the pans, then flip onto cooling racks and make the frosting. Put the egg whites and sugar in the bowl of your mixer. Set the bowl over a pan of simmering water on the stove. (Make sure the bowl is just suspended over the water, not actually touching it!) With a whisk, beat the eggs and sugar in the bowl, until the mixture is hot to the touch (around 3 mins; the sugar will be dissolved and the mixture should -- theoretically -- look shiny; mine never quite got past foamy before it was hot enough that I knew I had to remove it or risk making scrambled eggs, so don't worry too much if you can't get the shine). Take the bowl off the heat, and use your electric mixer with a whisk attachment (or a firm hand, if you are without electronics) and beat on medium until the mixture is cool, about five minutes. Keep one hand on the side of the bowl so you can feel when the temperature has changed. Then, using the paddle attachment of your mixer, beat in the butter one half cup at a time. Beat for another 5-10 minutes, until the icing looks thick, like a butter cream. Do not freak out if it goes through a brief curdled/separated phase at some point in the beating, just keep mixing and it will right itself. Once your mixture looks like butter cream, add the lemon juice in 3 batches. Mix on medium after each addition. Finally, add the vanilla. 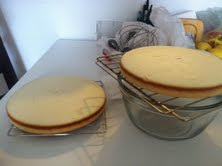 Cut each of your cakes in half horizontally, so that you have four cake layers. Heat up the jam enough so that it is spreadable. Take two of the layers. Spread one with jam. Spread the other with frosting, sandwich them together. (I first tried to put the jam and frosting on the same level, but that made a mushy mess of jammy frosting. Franklin tells me I could have solved the problem by chilling the cake after I put the jam on an before I put on the frosting, but I think my pb&j inspired solution worked pretty well!) Put a layer of jam on the top. Put frosting on another of the layers, sandwich it on. Repeat, with the remaining layers. Then frost the whole thing with the rest of the buttercream. Decorate with fresh raspberries. 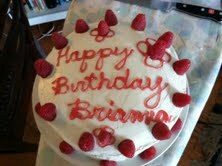 (I also wrote on the cake with raspberry jam. I just put some of the heated up jam in a plastic bag, snipped off one corner, and then wrote with it as you would an icing tube.) Enjoy! I just got back from mini-East Coast road trip. I spent a day each in Boston (to pick up my new (old) car! ), New York City (to see some friends and to go to the Alexander McQueen at the Met -- if you can get there before August 7, the hour and forty-five minute line is definitely worth it), and Philadelphia. In Philly, I spent the afternoon with a friend who had her first baby six months ago and has learned that as long as she is still breast feeding, her baby's allergies are her allergies. Unfortunately for a butter-loving baked-good eater like her, the baby is lactose intolerant! I promised her when we planned the visit that I would come armed with a recipe that wouldn't upset the baby and that wouldn't take much time. These cookies fit the bill perfectly. They have only five ingredients and take only five minutes to make. I turn to them a lot when I want to bring s omething home made but am feeling lazy. They also require no equipment beyond a bowl, a spoon, and a cookie sheet, which makes them a good go to when you are on the road and don't know how well-equipped a kitchen is going to be (although, for the record, my friend's kitchen has everything a girl could ever want for a baking project -- I once made a wedding cake in it). Preheat the oven to 350. Combine the first three ingredients in a medium bowl and stir until the sugar has all disappeared. Lightly beat the egg and then add and stir thoroughly. Add the chocolate chips. Roll the dough into round balls, using anywhere from 1 to 3 heaping teaspoons of dough depending on how big you want your cookies to be. Bake for about 11 minutes. It is the last day in the office for two of my coworkers and I had a vat of blueberries needing eating, so I did what I always do when I have an ingredient, and I can't decide what to do with it. I asked Martha! I narrowed it down to blueberry buckle and a blueberry lemon bundt and let my departing colleagues decide. Buckle it is! Of all the jammy fruit-centric desserts--pie, crisp, cobbler, crumble, brown betty, etc.--buckle, which is essentially a fruit-intensive cake with a streusel topping, is one of the most cake-like (you can make it more or less so by increasing or decreasing the amount of blueberries in the recipe). Like its cohorts though, it is an extremely forgiving dessert, much less susceptible to the demands of precision than, say, your average scone or yellow cake. So feel free to tailor both the streusel topping and the dough to your tastes. For instance, I wanted to substitute in 1/3 cup of almond meal, but discovered the bag of almond meal I had stashed away and was saving for a special occasion was almost three years old and had gone bad. Note to self: there's no point in buying expensive ingredients if I'm going to hoard them! Disappointed about the almond meal failure, I decided to spice up the streusel by replacing the standard cinnamon with ground ginger. Some grated fresh ginger might have been nice as well, but I didn't have any on hand. The ginger gave the whole thing a bit of a savory flavor, making this a nice light summer dessert. It could really have used a dollop of vanilla ice cream, but unfortunately there's no freezer in my office. One of my coworkers pointed out that because buckle is made in a spring form pan, it is actually baked with a buckle! This prompted me to wonder where on earth the name came from. Probably not because of the pan, which I use for all sorts of baking endeavors. It turns out that the recipe below is not the only way to make a buckle, and the other method explains the name. By the other method, you empty the batter into the pan before added the fruit, pour the fruit on top of it, and then proceed to the streusel. During baking, the cake will rise, buckle around the fruit (think a boulder field in an earthquake), and voila! Total Time: 1.5 hours; Sweetness Factor: 3; Richness Factor: 4; Difficulty Factor: 3; Chance We'll Make it Again: 9. Preheat the oven to °350. Prepare a 9 or 10 inch springform pan (if you go with the 9, you might want to stick to the lower end on the blueberry scale). Butter and flour. Combine flour, baking powder, salt in a small bowl. Whisk together and set aside. Cream the butter and the sugar i n an electric mixer (stand or hand held) on medium speed. Once the mixture is light and fluffy, add the maple syrup. Turn the speed down, scrape sides as necessary with a rubber spatula, add the egg and vanilla. Add the flour mixture in three additions, alternating with the milk. Using a spatula (not the mixer! 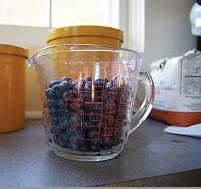 ), fold in the blueberries. Dump the dough into the prepared pan and spread it out evenly. To prepare the streusel, thoroughly whisk together the first four ingredients, and then cut in the butter. You can do this with a fork, two knives, a pastry blender, or a cuisinart. Mix until the mixture looks rough and sandy. Pour the streusel over the dough and spread it out evenly. Bake for about an hour. The tester will come out stained blueberry blue but should be batter free. Cool on a wire rack for about 10 minutes before removing from the pan. Having a glut of sour cherries from the farm share, we went in search of chocolate cherry recipes. Because what else was there for us to do!There were lots of cakes out there, but something about the recipes seemed unsatisfying. What we really wanted was a chocolate version of a classic cherry crumb cake. The first attempt resulted in a sort of cherry chocolate goo. The crumble had no flour at all. Instead it was made of almonds, unsweetened bakers chocolate, butter, and gobs of brown sugar. The brownies cooked through well before the top layer set, so we tried a few minutes under the broiler. The result was delicious, but difficult to serve, and since the occasion was a boss’s going away party, we thought we needed something slightly more professional looking. Note: without time to try to a new recipe before the party, we went ahead and served them, and there were no complaints. The topping was a yummy mess of caramelized sugar, cherry, and chocolate flavors that went perfectly with the brownie. But there was chocolate everywhere by the time it was over, and you could really tell how much butter was involved. (If this is the sort of thing you’re going for, we’ve included that recipe below as well.) The second attempt had less of the caramel note in the topping, but was also decidedly less gooey (in a good way). We suggest you try both. Prepare a 9 x 13 baking dish. Butter, line with parchment paper, and butter the paper. Preheat the oven °325. Adjust rack to bottom rung of the oven. Combine butter, sugar, cocoa, and salt in a glass bowl. Either place over a pot of boiling water to melt butter or put in the microwave for twenty second increments. Once the butter has melted, stir vigorously. The batter maintains a gritty look at this stage. Add the vanilla and eggs (one at a time), and stir until combined. A whisk or a wooden spoon works fine. The batter should now look glossy! Add the flour and stir until it all disappears. Pour into the prepared pan and spread out as evenly as possible. Sample (unless you are concerned about salmonella). Pit the cherries and slice them in half. We skipped the slicing because we were short on time, but slicing will result in better chocolate cherry distribution. Press them into the top of the dough. Note: we assume canned cherries would work just fine, if you can find canned sour cherries. Let us know if you try it! Combine sugar, cocoa, flour, and walnuts in a food processor and pulverize. Add the butter and pulse until the mixture looks sandy. The volume is just slightly too large for a mini cuisinart, which is all we had in the kitchen we were working in, so we did this in two batches. Pour the crumble over the cherries and batter and spread it out evenly. Bake 50 minutes. Note: these may never look completely done, but any longer, and they’ll burn. Allow to cool completely (If you can, we didn’t make it. In fact, we didn’t even make it the full fifty minutes without sampling). Same as above, but use 15 tablespoons of butter in the brownies instead of 13. For the crumble, food process 1 cup brown sugar, ½ cup almonds, 2 ounces unsweetened chocolate. Add 3 tablespoons butter. Make sure the crumble fully covers the brownies and cherries to prevent burning. Bake for 40 minutes. Then put under the broiler for 3 minutes. Watch carefully.